According to the recent release of the updated U.S. Department of Agriculture (USDA)’s farmers market directory, the number of farmers markets across the nation increased by 17 percent between 2010 and 2011. Support for farmers markets helps to provide income opportunities for farmers. The rising interest for local food from nearby farms highlights the value of protecting farmland to meet demand. The America’s Favorite Farmers Markets contest is a part of American Farmland Trust’s No Farms No Food® campaign, which raises awareness of the dangers of farmland loss by making connections to food. Farms near metropolitan areas produce 91 percent of the nation’s market value of fruit, 78 percent of vegetables, and 67 percent of dairy products. To view the top 20 leader-boards or to vote in the America’s Favorite Farmers Markets contest, visit www.farmland.org/vote. Attleboro Farmers Market not only brings local foods & goods to the people in our city. But it is also breathing a breath of new life and sense of community that has been missing in the down-town area of Attleboro for far too many years. 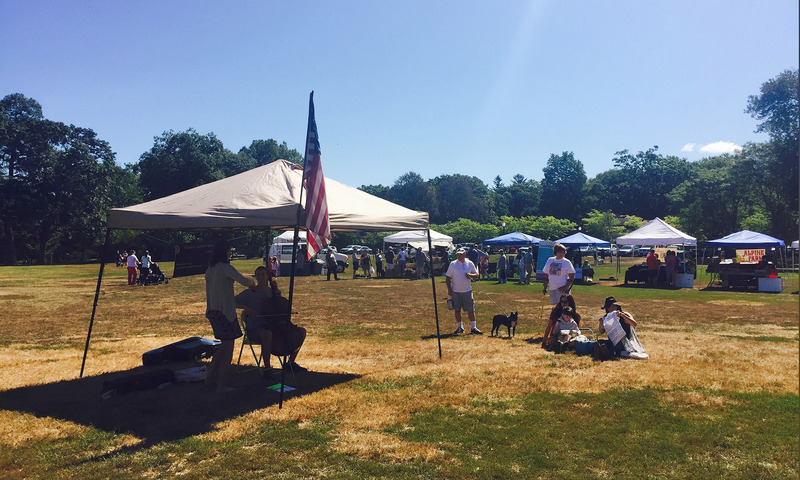 Attleboro Farmers Market is a grassroots market that really caters to the city needs. My favorite part is going and socializing and seeing people I typically wouldnt get to see in the summer. The variety of items for sale is wonderful. Attleboro’s farmers market has a wide variety of produce as well as other well needed locally products. It is in a centrally located and visible site and is well organized. I can count on having the items that I am looking for and be greeted with smiles! Because my aunt is the best market manager ever. Buying local is one of the best ways to support your community! Great market – awesome vendors! Great place to find local fruits & Veggies as well as other local items. There’s always something new each time I visit the market. Great variety of vendors and Scorpios bread and garlic! It is a great farmers market with a wide variety of vendors. It is a great places to get fresh vegetables and a great support of our community. It is really fabulous and a great thing for our lovely city of Attleboro! I love it. Lots of vendors with a city focused twist! LOVE IT!!!! Love all the great local vendors. My sister is the market manager! Newly renovated after 25 continuous years we now have 25 vendors on a regular basis and more than 1000 vistors each week. People are loving it. Local Farms Fresh Food! Our market has been in place for over 20 years and thanks to the community involvement it has grown from 3 vendors to 23 vendors this year. Great spirit and variety for our local vendors to get involved with. A bonus for both people purchasing and people selling. Started in the community by committed people looking to give back and make a change. The Attleboro Farmers Market has lots of participating vendors offering varied products at competitive prices. The market is conveniently located right in center of downtown and there is a great community spirit every time we visit. We vote to make the Attleboro Farmers Market as America’s favorite Farmers Market! The Attleboro Farmers Market is a showcase of local produce and products. There’s nothing better than homegrown and homemade! they are the friendliest bunch of people. and the vendors are so great. love looking forward to saturday to see who and what is new. never leave empty handed. This newly revamped market has come out of nowhere and has done a great job bringing together many great local vendors and large crowds as well. There are many great events planned as well! 1.) Got to meet alot of new nice people from all over. 2.) fthe vendors are all like one bir family. 3.) Heather & Ed & Rich go over and above to insure that this market is the best every week. Attleboro Farmers market is a great place to shop on a Saturday morning. I love to shop around at all the vendors and I always run into someone I know! Attleboro is a community filled with pride and heritage and the Attleboro Farmer’s Market has wonderfully merged the two! Attleboro’s Farmers Market is not only wonderful for the community but it helps the growers as well. Great people. Ground up movement. Varied themes. Awesome energy. I like to support the local farmers. It nice to have a place nearby that we can buy fresh vegetables and fruit. organic and local vendors that rock! The area I live in is so lacking in farmers markets. I was so glad that the city I just moved to was starting up a farmers market. It is a well organized market with a broad variety of vendors and everyone there is so proud to be a part of it all. I love my farmers market! The Attleboro Farmers Market is truly a community experience. Each week that I go I experience a new vendor with great wares and learn about their business. I have experienced some great foods that I might not otherwise have seeked out. The people who run the event our so nice. They have a nice variety of products and it’s close to my house.